Roland discusses work-life balance, his work as a Sales Specialist, and team member engagement at Raven. Roland Nifong is a Sales Specialist in Raven Engineered Films’ Industrial group. While he sells the same products as other Engineered Films salespeople, our customers often use these products in very different ways, from tree watering bags to truck bed liners. Roland, specifically, acts as a liaison and “micro-project manager,” providing knowledge and insight as to what our products can and cannot accomplish. Roland has a unique history with Raven. He worked for the company for about five years, then ended up taking a job with another company. Eventually, he found his way back to Raven, and he has been in his current role for over a year. Work-life balance is a core value at Raven. Roland explained that in his previous industry, he was overloaded with work, to the point where it was difficult for him to keep it all in check. As he put it, the Raven focus on the total person is what helps him achieve work-life balance. The Raven value of Peak Performance — preparing ourselves as individuals, as well as a corporation, to be our best — encourages team members to set and achieve goals related to wellness of the mind, body, and spirit. Resources such as our on-site fitness center, training and development programs, and paid time off for volunteerism make it easier for Roland — and many others — to achieve these goals. While at work, Roland embraces the Raven commitment to service wholeheartedly. He strives to provide quick, complete responses — providing the customer with helpful information, not just pushing products. To him, it’s about solving problems, giving the customer helpful options, and rarely, if ever, doubting the capabilities of the Engineered Films team behind him. 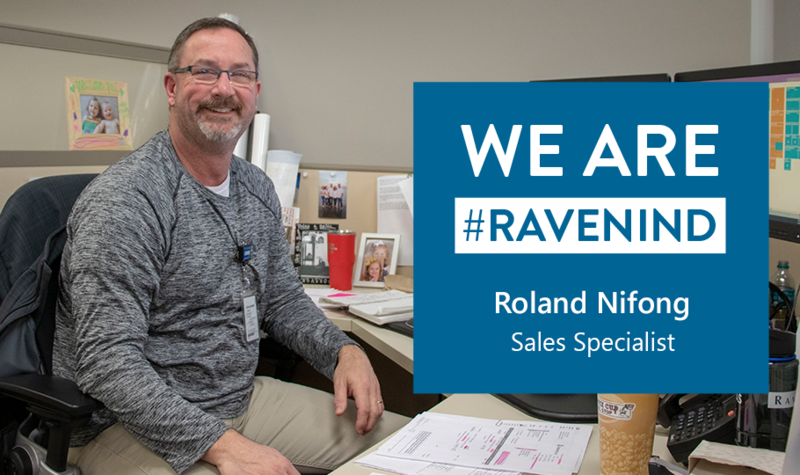 As a Raven Ambassador, Roland is one of many highly-engaged team members who are helping with improvements to team member engagement and culture. He noted that, while “it’s always easier for Roland to worry about only Roland,” he really enjoys being a member of the Ambassador team because it brings him a different perspective. Alongside his fellow Ambassadors, Roland is helping find ways for Raven team members across the globe to engage more fully in the company’s unique culture. He noted that, while Raven tends to be a conservative company, we are cutting-edge in offering opportunities to be engaged. Every week, Raven offers events, educational classes, and activities where team members can interact with others from across the company. Plenty of resources are also available to stay “in the loop” as a member of the Raven team, including newsletters, digital signage, and more. All in all, Roland exemplifies many facets of the Raven culture — balance, drive, authenticity, and continuous improvement — in his everyday work and life. As a high-drive person, he drives results in all aspects — providing quality service to our customers, seeking different perspectives on our company, and always working to achieve true work-life balance.